It is with a heavy heart that we share this information with the George Washington and Lyons School District 103 Community. The school was put on a lockdown through the duration of the incident. We worked in collaboration with the Lyons Police Department and are thankful for their continued support. Members of the school’s crisis response team are available to assist students and faculty in light of this incident. The school has communicated with all parents, who can contact school administrators or counselors for more information about counseling supports and crisis services. In an effort to enhance Parent/School Partnerships, you are invited to a meeting to give parents suggestions to successfully manage: Student Stress, Student Anxiety, Student Grief and Loss. The Illinois State Board of Education requires all Illinois public school students in grades 3-8 to participate in state-administered testing in reading and math. The 2019 Illinois state achievement test is called the Illinois Assessment of Readiness (IAR) and it replaces PARCC. Lyons School District 103 students will take the assessment during March 11th - April 12th. Third Grade has been working very hard on learning their multiplication facts as well as exploring non-fiction texts. 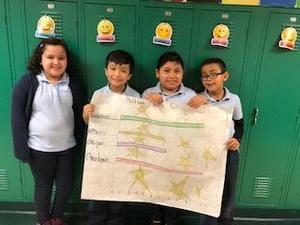 Collaboration at Costello allow students to share ideas, learn from peers and bring joy while learning math and reading skills.